As a world leader in the design and manufacturing of medium-voltage fuses and high-voltage fuses, Eaton offers the only full-line manufacturing of current limiting and expulsion fuses for the ANSI and NEMA markets. The fuses are available in E-Rated, R-Rated and C-Rated, and provide protection for power transformers. Intended for voltages 2,400 VAC to 38,000 VAC, medium and high-voltage fuses protect 2.4-145 kV voltage systems. E-Rated fuses are primarily used to protect feeder circuits, power transformers and potential transformers. 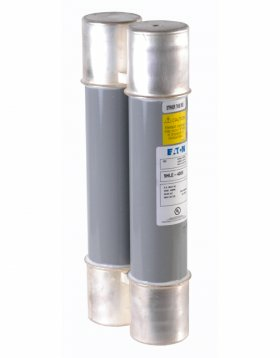 Eaton has a full variety of E-Rated fuses; from 2.4kV to 38kV. R-Rated fuses are utilized as back-ups, offering short-circuit protection for motor circuits. Used in conjunction with MV motor starters, they provide overload protection for the circuit. Eaton carries a full range of R-Rated fuses; offering 2.4kV, 5.08kV, 7.2kV and 8.3kV. C-Rated fuses are current-limiting fuses that include the continuous current of the device. They carry a minimum melting current to continuous current rating ratio of 1.6:1 to 1.8:1. For more information on medium-voltage fuses & high-voltage fuses from Eaton, click here to view a PDF.